Juggling a full-time job, side hustle, and passion project? Some of these links are affiliate or referral links, which means that if you click through and make a purchase, I will receive a small commission at no additional cost to you. Find out more HERE. HERE'S a handy tool for creating graphic elements of all kinds, including but not limited to logos and media kits. In my opinion, Canva is the best free alternative to Adobe Illustrator/Photoshop and an incredibly useful tool for designers and non-designers alike. I'd highly recommend it for creating Pinterest graphics, banners, and content upgrades for your blog or website. 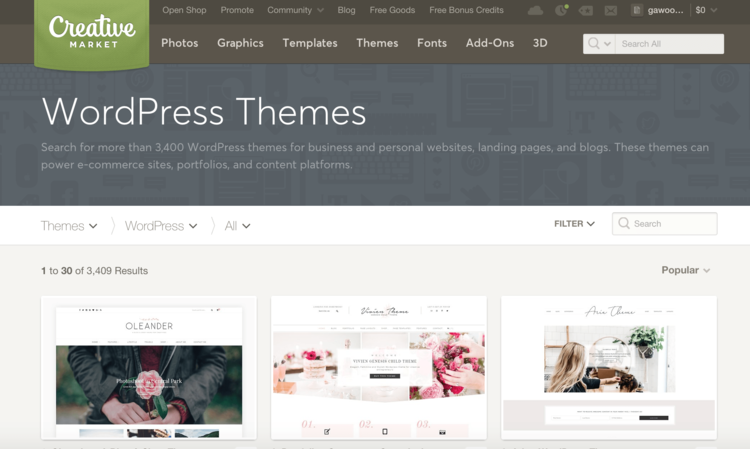 CREATIVE MARKET is an excellent resource for blog themes, stock photography, design templates and other digital assets. If you subscribe to Creative Market's newsletter, you'll receive free design goods every Monday. I always take advantage of this feature and suggest you do the same (if you haven't already)! SITEGROUND is one of the most reliable web hosting services out there, and it's currently the platform that hosts my personal blog. I can always count on Siteground's customer support to respond quickly to my questions regarding plugins, backups, and anything else that comes to mind. For beginner bloggers, I would highly recommend purchasing the "StartUp" plan. WORDPRESS is the platform that I use to build and manage my personal blog. Ever since I switched from Wordpress.com to self-hosted, I have not looked back! Definitely take the self-hosted route if you want to monetize your blog properly and own all your content. If you post a lot of content on your website, I'd go with Wordpress over Squarespace. SQUARESPACE is an all-in-one website-building service for tech-savvy and tech-averse individuals alike. It calls for less of a learning curve and comes with pre-made templates that you can easily customize. I use Squarespace for gawoonchung.com and would recommend it to small business owners who want to showcase their services online. MAILERLITE is a choice email service provider for anyone seeking to build an email list. You can send an unlimited amount of campaigns to up to 1,000 subscribers every month for FREE, which is especially convenient for the beginner blogger on a tight budget. I use Mailchimp as well, but I find it a little outdated in comparison to Mailerlite. LIBSYN is the hosting service for my podcast Dear Creators. The platform recently released a new mobile response stats interface and it's pretty awesome. Plans start at $5/month for 50mb of monthly storage. ASANA is what I use as my content/general calendar for all creative projects and business-specific tasks. Along with Trello, Asana is my favorite digital project management tool. The "boards," checklists, and drag-and-drop features of Asana are just a few of the reasons why Asana is a lifesaver for the scatterbrained. G SUITE for the Gmail account associated with my business. The reason I recommend switching from free Gmail to paid G Suite is that you get access to some really important features, including but not limited to a custom business email @yourcompany, unlimited group email addresses, 99.9% guaranteed uptime, twice the storage of free Gmail, zero ads, and email support. I'm on the basic plan, and it only costs $5/month. **Click through my link and apply promo code F9C6RMEJWPU33FA to get 20% off the first year of your G Suite Basic plan. If you're not sure how to proceed, here's a helpful set of instructions. LASTPASS is a secure password protection service that allows you to keep ALL of your passwords in one place. This handy system will populate your login information automatically on any selected devices. CREATIVELIVE is by far my favorite learning platform online. It's free to use and a goldmine full of valuable content. In fact, some of the world's top experts, thought leaders, and entrepreneurs have taught courses on this platform (e.g. Vanessa Van Edwards, Tim Ferris, Ramit Sethi). Each week, CreativeLive broadcasts a new selection of classes that you can watch live for FREE. If you miss an on-air broadcast, you can always buy the class and tune in on your own time. I definitely recommend "Ditch Your Day Job" by Michelle Ward, "Start Late, Finish Rich" by David Bach, and "Create a Knockout Graphic Design Portfolio" by Ram Castillo. DUBSADO is a CRM that I recently started using to send invoices. I love the e-signature feature and the customization options. This system is free with your first 3 clients and provides helpful tutorials for new users. Use my offer code "gawoon" to get 20% off your first month! sign up for my free resource library below!